You have added Radiant Red Floral Embroidered Anarkali Suit with Net Dupatta to your Shopping Bag! Feel like a diva in this ravishing radiant red this heavy embroidered Anarkali suit with intricate floral embroidery. The floral multi-coloured pattern on shoulder, sleeves and bottom of the top is striking. 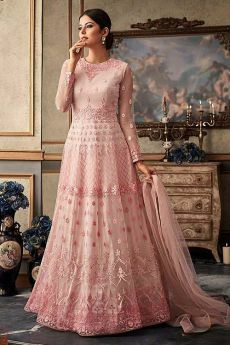 This net anarkali is teamed with raw silk lining and bottom and beautiful net dupatta with attractive golden lace border. It is a beautiful outfit for any special occasion and will surely get you some amazing compliments. Complete your look with matching accessories and enjoy all the attention.